View More In Headlight-Taillight Combinations. Another new front bike light introduced by MagicShine - 2000 lumens(theo) provided in a small neat little lighthead with the standard 20 degree beam pattern. The maximum output of 2000 lumens(theo) is powered by 2 CREE XM-L2 LED's and TIR optic lens. The light can be operated by the 2.4G wireless remote control button or of course the button located on top of the light head. The 5.2Ah 7.4V battery new streamlined battery pack straps on with two velcro straps and has a rubber pad to protect your frame and hold it tight. The connector is common with most other batteries. The rear light is attached using the standard 'o' ring system, as does the front light, however the 'o' rings have been redesigned to fit two sizes of bar in one. The new stainless steel mounting bracket is bullet proof and uses MagicShine's new custom molded straps or the standard O-ring to mount it up. 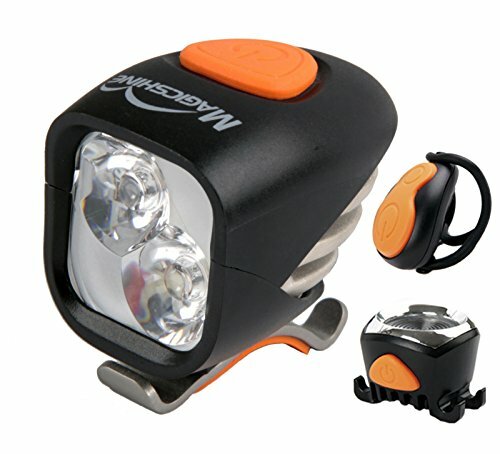 MAGICSHINE BIKE LIGHT FRONT AND REAR COMBO: FULL VISIBILITY & PROTECTION WHILE YOU TOUR ★ The Magicshine MJ-902 led bike light gives a respectable 1600 lumens of power. Our bike lights front and back set is powered by 2 CREE XM-L2 LED's and TIR optic lens.The included tail light provides positive visibility from the rear, day or night. The bicycle tail light is attached using the standard 'o' ring system, as does the front light. WIRELESS & RECHARGEABLE BIKE HEAD AND TAIL LIGHT SET; THE PERFECT 'GET ME HOME LIGHTS' FOR CITY RIDERS ★ Durable, long-lasting and bright: the 5.2Ah 7.4V battery new streamlined battery pack straps on with two velcro straps and has a rubber pad to protect your frame and hold it tight. The connector is common with most other batteries. Operated via 2.4G wireless remote control or button located on top of the light head. UNIVERSAL FIT MAGICSHINE HEADLAMP & REAR LIGHT COMBO MOUNTS AND DISMOUNTS IN SECONDS: NO TOOLS REQUIRED! ★ There's nothing worse than a complicated installation, so we crafted our bike rear light and bike front light for easy mount. Both the front bike light and rear bike light heads feature new stainless steel mounting. Bracket is bulletproof and uses custom molded straps or the standard O-ring to mount it up. If you have any questions about this product by Magicshine, contact us by completing and submitting the form below. If you are looking for a specif part number, please include it with your message.